The sustainer helps people sustain themselves, on the base of the local ecosystem and the on-site occurring natural and produced resource circuits. The development of the prototype is done within the framework of a permaculture design strategy. The initiative has developed a first prototype of `The Sustainer´, which is being exhibited in the `Inside Ecologies – Environment As Interaction´ exhibition at the interdisciplinary art centre Weltkunstzimmer in Düsseldorf, Germany, in the summer of 2018. The fist strategic steps contain a site analyses and an input-output analyses of the local system on site. 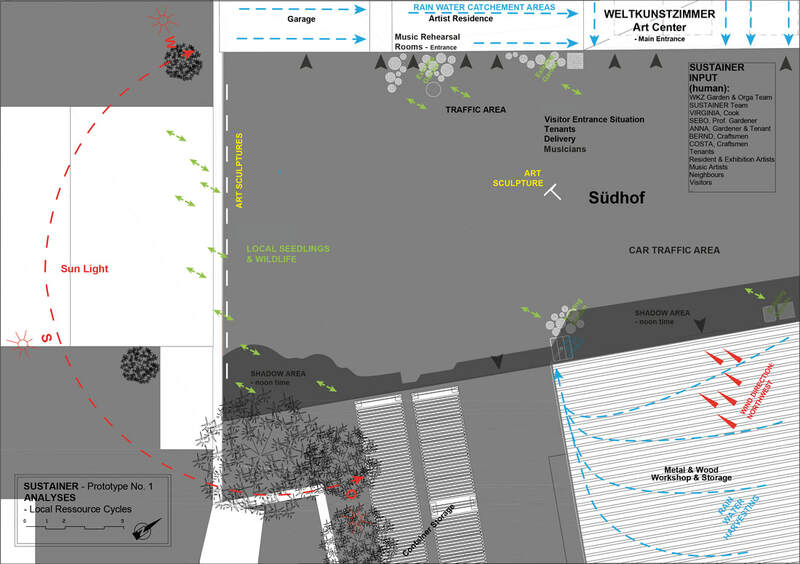 Everything on site, which can be made of use for the project, the so called input gets mapped. 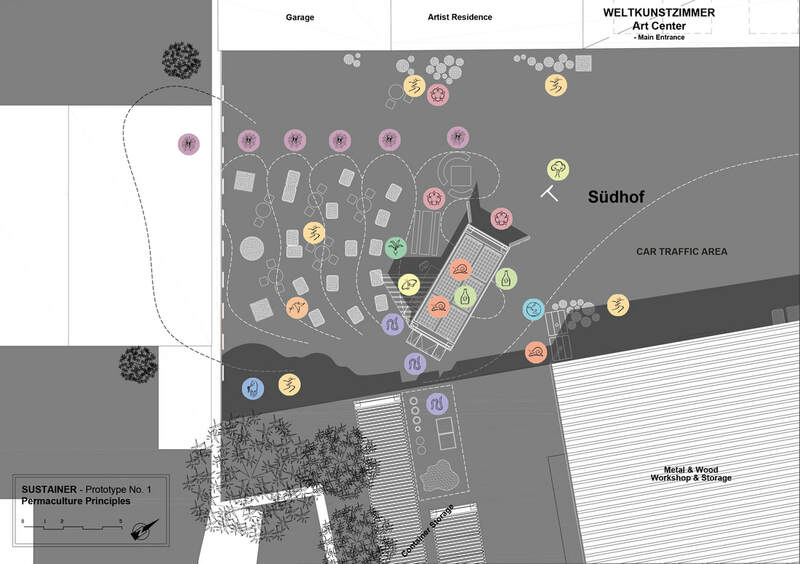 The map shows the on-site located ressources, like rainwater, wind, solar rays, vegetation, animal world,… Furthermore the human input, as in different usages and functions, activities and the active people themselves get documented. - Energy circuit: The energy circuit gets utilized by an off the grid 12 V solar system, with 4 solar panels installed on the container roof. Lighting, ventilation and further electrical devices get run on this basis. - Biomass circuit: A garden consisting of raised beds, presenting permaculture plantation principles in an exemplary way, is put up adjoining the sunny side of the container, facing south. The garden is being taken over and appropriated by the local residents and users, for the time of the exhibition. The raised beds consist out of upcycled industrial tubs, which were left behind by the communal bakery, that existed on site in the past. The garden, with mainly edible plants, is organized in concentric zones starting from the container. The more frequently the zones are used, e.g. the salad plant zone which gets frequently harvested, are more close to the container, the least frequented ones, like the wood zone for growing fuel resource, are the furthest away. The biomass circuit develops on a long-term base, if the food gets grown, harvested, cooked, ate and defecated on site. The defecated feces and urin get mixed with biochar and saw dust in the toilet and further on left to a composting process. The result is highly fruitful earth, so called Terra Preta Earth / Black Earth, which, like the urin, is brought into the garden again as humus soil. The different circuits of the local ecosystem stand also in close relations to each other, as well as with all local influences – seedlings from surrounding plants, the passing by animal world and last but not least the surrounding usages and activities in the commercial courtyard of the art center. All these stir a local system with tight, cyclical and interchanging relations, which get supported by the Sustainer, to not only satisfy human needs, but also to reconnect people, the place and plants/animals more consciously with each other. 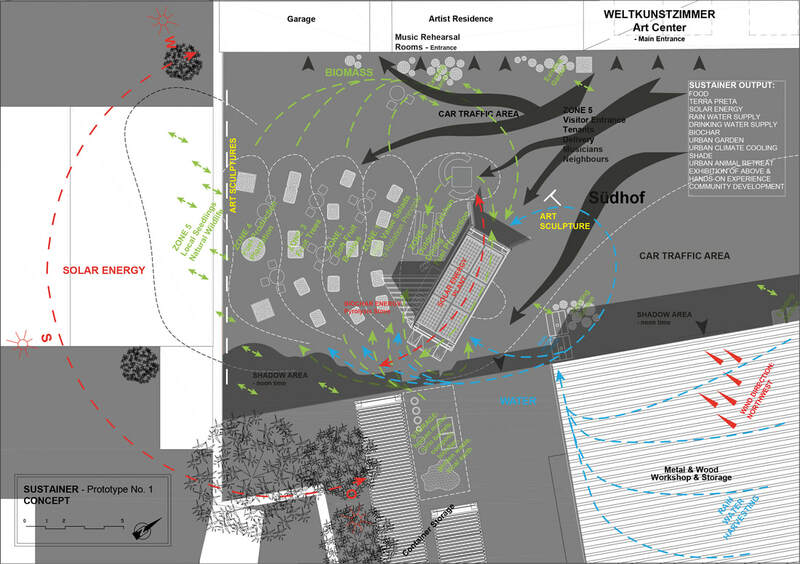 For further information, please open link about the on-site applied or found permaculture design principles (in German). The most fundamental human needs shall be satisfied: cooking, eating, toilet and washing. 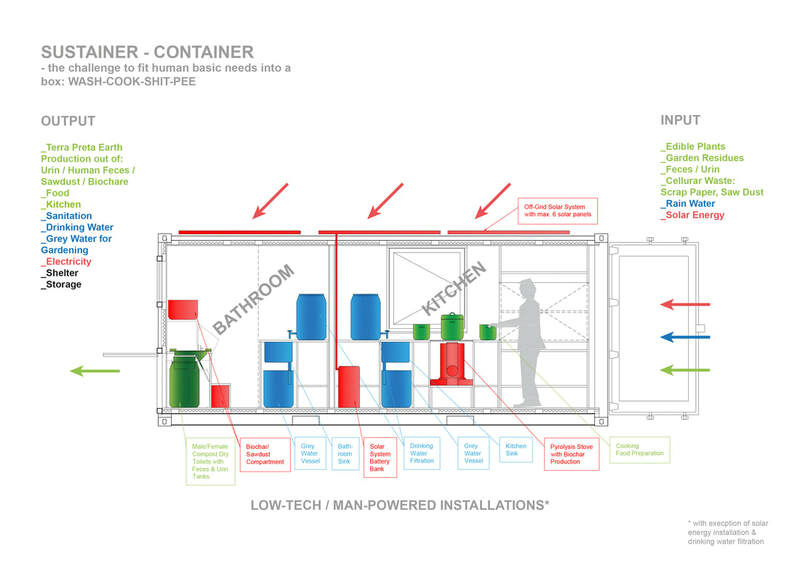 The graphic shows an input-output-analyses of the rebuilt cargo container of the Sustainer. The input consists of diverse local ressources which get supplied to the container, consisting of edible plants, rain water, solar energy, feces, urin and garden residuals, as also residuals from the commercial courtyard and its businesses. (e.g. paper waste). The output consists of ressources, which get recovered by the sustainer, consisting of food, Terra Preta earth (highly fertile humus earth for garden use), drinking water, grey water for the garden, electricity and the supply of a bath and a kitchen. To minimize the resource consumption and to cultivate an awareness for the daily used ressources, low-tech applications get applied. The water is carried through man power bucket by bucket from the rain water tanks to the toilet, kitchen and garden, same as with the grey water, which is carried from the toilet and kitchen into the garden. The mobile drinking water filtration works with gravity. The mobile pyrolysis stoves are run with wood, found in the garbage disposal of the commercial courtyard. The gathered feces and urin is taken in barrels manually from the toilet. There is no canalisation and no water plumbing. Electrical wiring, to run the solar energy system with its electrical devices is the only installation layed out. The electrical system and the drinking water filtration device are the exception, in being the only high-tech solutions the Sustainer is equipped with. Furthermore, the Sustainer container itself is a local resource, which is an on-site found used container, which got rebuilt and outfitted, with the maximum of upcycling of on-site found building elements and materials, e.g. windows, doors, metal profiles, sinks, etc. New building elements got added if not available uses, as in the wood interiours, including the insulation. The Terra Preta production is a mayor link in closing the biomass cycle. It is ideally based on the harvested wood on site, used as cooking fuel on site, ending up as biochar, and based on the edible plants, being cooked and ate on site, ending up as feces and urin in the toilet on site. The dry toilet, also known as compost toilet, is the key element in the terra preta production. There are many advantages to dry toilets, that are being tested around the world. The western world solution of the water closet for waste `disposal´ has caused many problems and is dependant on surplus water / fossil water, which is being brought to drinking water quality, resulting in a secondary energy waste. The nitrates + phosphates in the toilet waste water cause further problems all the way to the sewage in lakes, the sea or at random cracks in the infrastructure, meaning additional overall costs and pollution. The simplest solutions are often the best, soonest and cheapest implemented, as it e.g. doesn't require any underground work/civil engineering and sewage infrastructure. The dry toilet is a simple and traditional solutions to avoid all the above mentioned problems. The urin and feces get collected separatedly in different toilets as well as in different barrels, according to gender appropriate use, see toilet graphic. During toilet use, they already get mixed with wood saw dust and biochar, next to the added toilet paper (1). During the resulting fermentation process, the covering material that helps dry the feces portion in the toilet barrel are conventiomal wastes such as rice husks or wood saw dust. These are acidic additions. Recent understanding of Terra Preta / Black earth has been leading to experiments with biochar (wood coal). The addition of biochar has been shown to reduce smell and bring the pH value to a more alcaline level, where worms are better able to complement the process of composting. The biochar/swadust use in the urinals, leads to absorption of the nitrates and phosphates, through which the biochar gets `charged´. Biochar is the major of component of black earth, as its cellurar structure is also a perfect vessel for all further nutrients the earth may contain. The full barrels are then sealed and moved to a compost facility, where the fermentation process continues for about 2 years, which also meets the requirements of existing hygiene standards (2). The final result of Terra Preta earth is achieved by enriching the finshed fermented earth with local earth.